Skip the boxed cereal and make your own! This is a recipe that I created for Bliss but it’s just too good not to share it with you all. 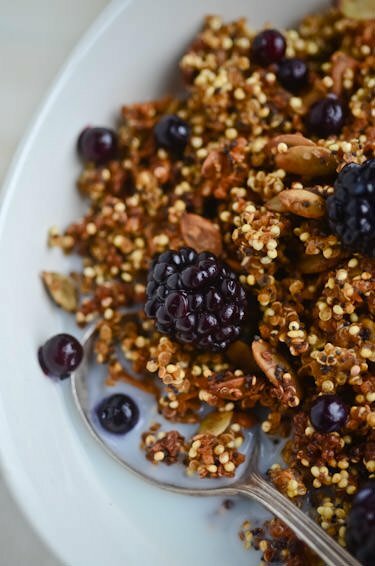 This is granola with a twist, it substitutes quinoa for the traditional oats for a super crunchy high protein breakfast to start your day the right way. If you’ve never cooked with quinoa it is actually a seed and related to the beet and chard family not a true grain. It is a complete protein, meaning that it contains all nine essential amino acids and has 6 grams of dietary fiber per serving. Besides lending a lovely spicy note, pumpkin is a great substitute for some of the fat called for in most recipes. 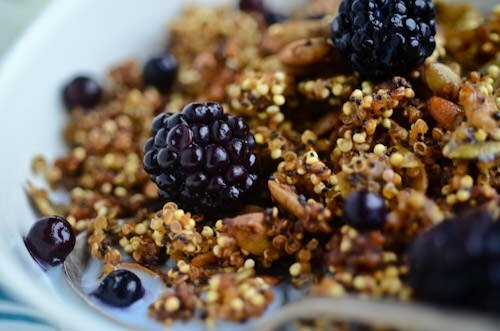 If you want a more traditional granola substitute 2 cups of oats for 2 cups of the quinoa and feel free to add raisins, cranberries or a different nut to the mix once it has cooled. Click the link below for the full post and recipe. Enjoy!